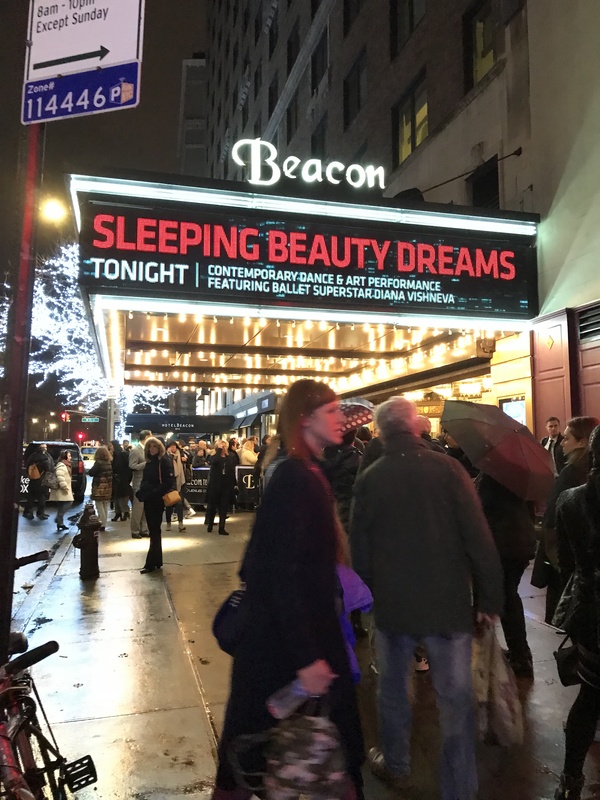 On December 14th, I joined a huge sea of people lining up in the rain outside of the gorgeous Beacon Theatre to see the New York premier of ‘Sleeping Beauty Dreams’. Sleeping Beauty Dreams was a work of splendid imagination, combining the dazzling capabilities of technology with human creativity and skill, cybernetics in the most fantastic and whimsical form. Suspended in time without logical sequence, the piece builds in grandeur, from mysterious to opulent. Costumes by Bart Hess played with movement, lightness, glitz, and technology. 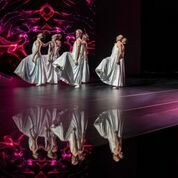 Floor-length white skirts lent ghostlike simplicity and elegance to the ensemble cast of men, while the Prince, danced by Marcelo Gomez, seemed shrouded in a cloud of bubbles on his tunic. Princess Aurora, danced by Diana VIshneva, changed costumes, but never wore the feminine apparel of dresses or skirts. 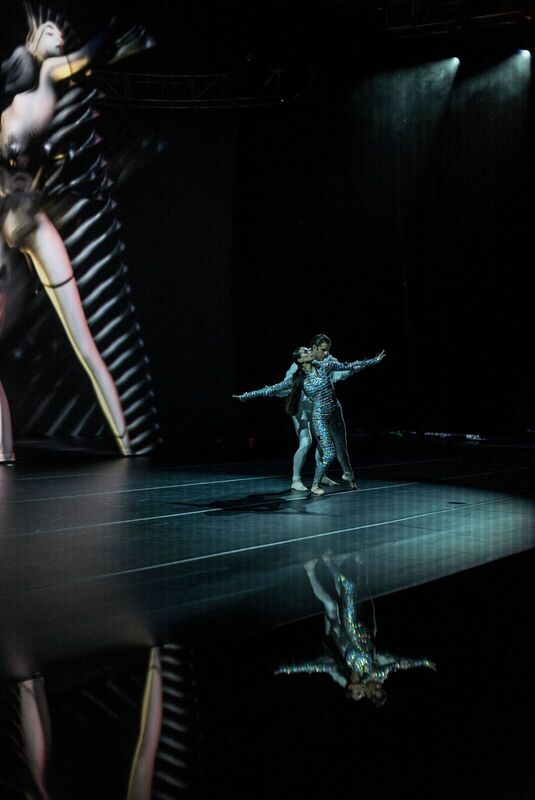 Costumes incorporated motion tracking sensors which produced virtual avatars of each dancer on the 50 foot long, 24 foot high projection screen. The dream world provided a simple premise with a fascinatingly complex execution for sight and sound. 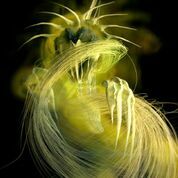 Exploring the question of where we go in our dreams, the work displayed exquisite irregularity, diverse velocity, and blurred the edges of good and bad so often cliched in fairy tales or ballet in general. Here, the future and past were intertwined, cause and effect erratic, each act was an island in time, to be judged on its own. The work became less successful for the ear the closer it verged on reality. 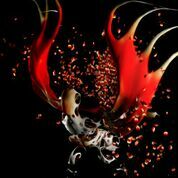 In one section, the mostly-amorphous soundscape from composer NOISIA followed a consistent electronic beat, similar to any average New York downtown club. This was the only moment in the performance that broke the feeling of imagined surroundings. 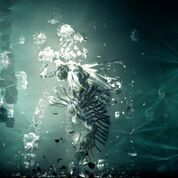 The digital art from Tobias Gremmler provided abstract design with enough visual clues to link to an idea or feeling of place; ripples as if underwater, giant dripping golden apparitions like liquid chandeliers, a soft infusion of reds and purples with shimmering golden shapes like leaves falling in a sunset. 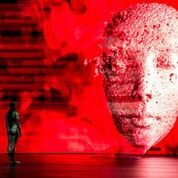 The dancers themselves and gigantic created characters by technology artists FUSE floated, loomed, dissolved on the screen behind the human figures. These visuals lent to the feelings of wonder, of grandeur, of romance without any literal information, drawing instead on creative approaches towards perception and storytelling. Contemporary choreography by Edward Clung helped pull viewers into a dream world without use of traditional steps or execution from the ballet canon; Diana Vishneva’s beautiful developpe a al second did not bring the arms into classical port de bras, a fouette from attitude derriere to devant maintained a bent, contorted position in the supporting and working leg. 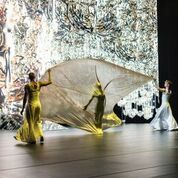 The most percussive and exciting dancing came from the ensemble, juxtaposed by the lightness of their costume, a unified example that dreams can be both beautiful and terrifying. They were able to achieve the looseness in the neck and rounding of the shoulders, the dropped center of gravity, a forceful dynamic necessary to differentiate ballet from contemporary dance. It is unclear if the choreography asked that Vishneva maintain her lifted alignment for storytelling purposes or if she as a ballet superstar, was unable to shake years of perfecting the illusion of classical ballet. The choreography did not seem particularly challenging for her and the consistency of grace in these sometimes diabolical environments leads to questioning if this role would tell a different story with a performer able to transverse to the gritty, rather than crystalline side of technique, beautiful as it was to see for the movement alone. Marcelo Gomez provided effortless partnering, allowing the sense of an environment unbound by the laws of gravity to emerge from his interaction with Vishneva. His presence in the piece seemed not to progress a narrative but rather alter the sound and light. 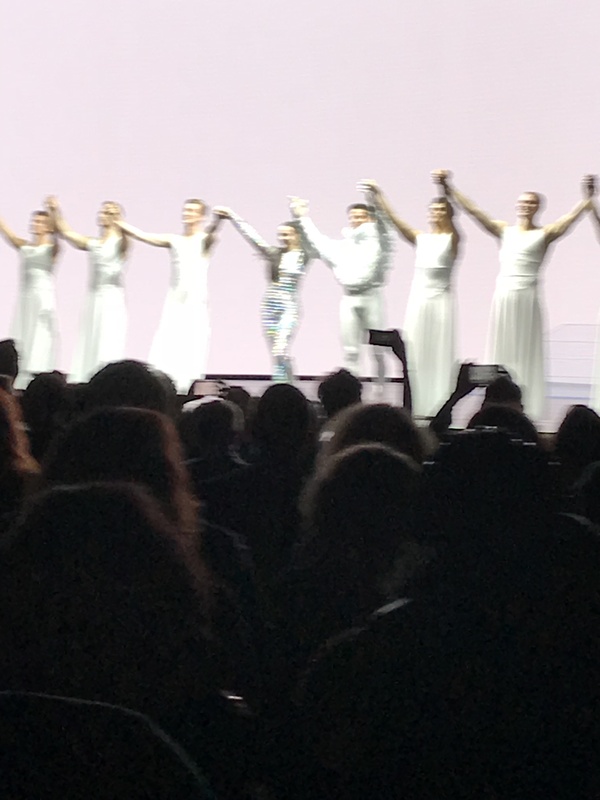 The difference in navigating these worlds between Gomez and the ensemble with Vishneva seems to question if in dreams we alter the environment or if the world and it’s inhabitants lay a blueprint for how we dance or move through it. For those who go to the theater to see something new, exciting, beautiful, Sleeping Beauty Dreams provides. For the curious, the non-prescriptive characterization of creature and environment in this beautiful abstract work provides a springboard into rich interrogation relevant to current culture and individual lives. 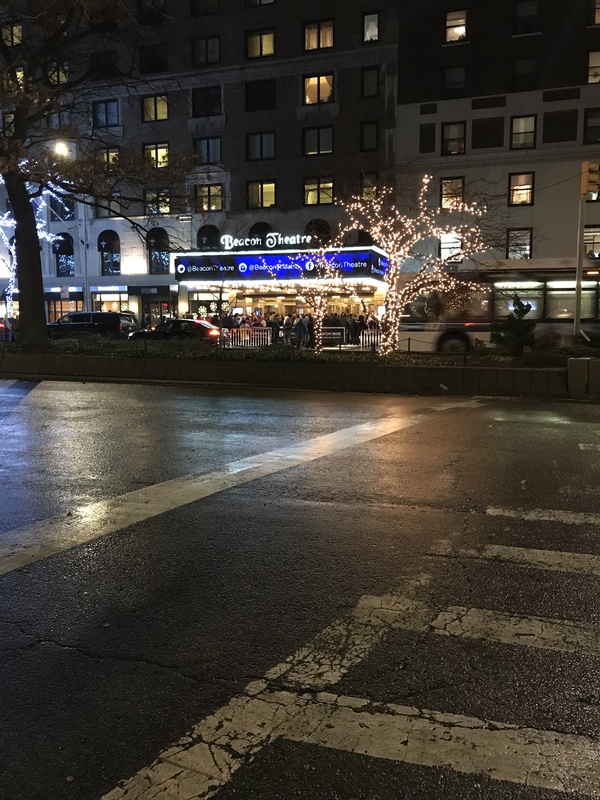 While every action and creation from the artists filling the Beacon Theatre was dazzling, the resulting effect on the audience was less glamorous. I have never been to a show where so many people took their phones out to take pictures or even video the live performance. One of the special gifts of live performance is in it’s ephemeral quality. There is beauty and sorrow that it does not last beyond the moment, it is that rarity exactly that makes it special and should serve to unify the gathering of humans comprising the audience for our brief, collective experience together. In no other civilization and no prior age has the human body been so technologized, reified, and endangered in so many uncontrollable ways. A show like Sleeping Beauty Dreams plays to the world we live in now, a world of images. Thus we must recognize a difference between the visibility of dance and performance and the invisible intrinsic value somewhere in the being of art. I think we are at a time when most people are too selfish for a gift like this piece to exist in a theater where there is a framework of etiquette so that all may enjoy it. The further a work of art ventures into the unruly world of possibilities, of creation, the harder the challenge to obey rules for taking it in. Sleeping Beauty Dreams was one of the most fascinating and beautiful artworks I have yet to witness, and also one of the ugliest examples of art appreciation. if this was a test of our ability in waking life to stay present, then this audience failed miserably. Is there anything beautiful enough in this world to get people to put away their phones and actually experience wonder through the human capabilities for memory, for perception through our eyes, brains, hearts?